Dave Hanron - The Business Outsource Guy: To "InMail" or not to "InMail"
To "InMail" or not to "InMail"
I wanted to touch on a controversial topic in this edition of my blog. I’m sure this will generate some great comments for all of you to enjoy. With the explosion of social media outlets these days, we’ve all become familiar with mainstream sites like Facebook, Twitter, Yelp, and You Tube. These are all personal sites and while they are sometimes used for business purposes, they remain predominantly for personal use. Linkedin on the other hand, has become widely accepted as the professional version of Facebook, currently used by more than 200 million business professionals to stay in touch with other business professionals. Like on Facebook, Linkedin users build a network of “Connections”, and have the ability to send private messages to our connections. One of the cool features of Linkedin is the ability to send an “InMail” to a professional who you are not connected to, looking either to connect or begin a business relationship. It is this feature of Linkedin I want to cover in this segment. I have read multiple articles both supporting the use of “InMails” and despising the use of “InMails”. I will try and recap both sides and then give you my perspective on it. After that, I’m sure the comments will provide a lively debate on the topic……. For many C-Level’s, receiving unsolicited “InMail” seems to be a turnoff and is considered “Spam”. Suggestions on contacting them range from connecting first, then sending a direct message, to submitting your request via their company website, to getting an introduction from a mutual acquaintance. 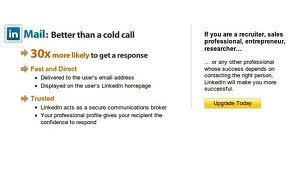 “InMails” are just another method to cold call someone, and “I don’t take cold calls”. Hmmm…….interesting position. 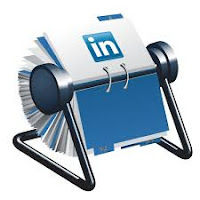 From the “InMail’er” position…..InMails are not on free Linkedin accounts. I pay for InMails, people should respond to them. Yes, I’m trying to connect with someone I may not know but I’m doing it in a professional manner, on a network designed for professionals. If someone doesn’t like the InMail offer, they can reply “Thanks but no thanks”. No harm no foul. …….OK, different thinking from both sides. Here’s my take on the “InMail technique. Yes, I have been a business professional for more than 30 years and spent the last 25 in various sales and sales management positions, so I could be a bit biased. Referring back to some of my previous posts on the art of cold calling, most of today’s C-Level decision makers were yesterday’s sales professionals. 20 years ago, executives would answer their own phone, or take a walk in visit from a sales person. Not today though. “Too busy.” “Make an appointment.” “Talk to my assistant.” “Send me your info via my website.” We’ve all heard the objections. Linkedin provides a medium to contact the C-Level prospects that we all want to reach and have the opportunity to speak with. If you have taken the time to join Linkedin, I think you should use it to its fullest extent. And that includes InMail. If you don’t want to accept InMails, there’s a field in your account setting where you can shut them off. If you have them turned on, then be professional and respond to them. Remember, the sales person has a job to do, and that is SELL. If InMails work for them, I say all the luck to them. Next time you receive an “InMail”, remember, your company has sales people who are probably using the same prospecting methods and you expect results from them. If you are not responding to other companies’ professionals, how can you expect any different results when your sales staff is reaching out to your prospects? And while I'm on the subject, my last personal pet peeve……..please get rid of the “Send your inquiry to info@abccompany.com” on your company website! At least give the sales professionals a fighting chance to get their foot in the door…….give them at least a name to f/u with rather than a dark hole. I look forward to what should be an interesting collection of comments…….. This is very good work and you are waiting for some great comments. I searched it whole the day yesterday and I found writing essay australia on your blog. Inmail is used for linking up. I wish people like it's feature. Learned Something Today…Keep it Short!